Adding a pond fountain or aerator to your pond is one of the most beneficial things you can do for the overall health and beauty of your pond. A fountain or aerator will circulate the water in your pond, add oxygen to the water, and a decorative pond fountain will add a stunning and dynamic water feature. An average pond without proper circulation (refer to the 1st quarter of the diagram to the right) has multiple layers of water, with each layer getting colder as it gets deeper. These dark bottom layers typically have little or no oxygen, which can decrease the amount of useable fish habitat and inhibit bottom-dwelling food sources (such as worms and crawfish). Another drawback to an oxygen-starved pond bottom is that organic debris (leaves, plant material, dead fish, etc.) are unable to properly decompose. This can result in an accumulation of black, smelly, anaerobic sludge that builds up over the years, making the pond shallower. Another drawback to heavily layered ponds is that they are more susceptible to fall turnovers and subsequent fish kills. When a pond has proper aeration and circulation, the layers in the pond are well mixed, and all zones of the pond have good oxygen levels, day and night. There are 2 main types of aeration, surface and bottom. 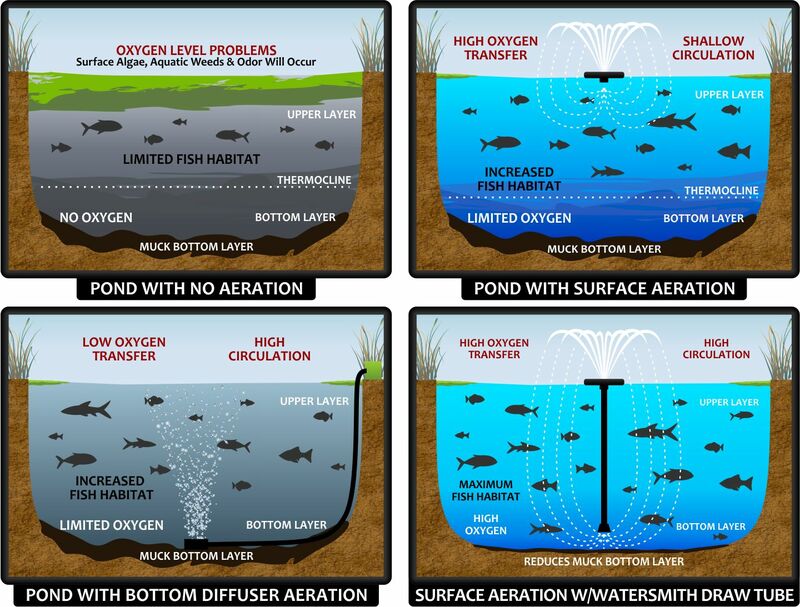 Surface Aeration is typically best in shallow water (ponds 6′ deep and shallower) or when large amounts of oxygen are needed quickly (refer to the 2nd quarter of the diagram above). Surface aerators physically break apart the water when the water splashes down, creating more surface area for the gas exchange. This effectively adds large amounts of oxygen to the water very quickly and is ideal for shallow water ponds as surface aerators can work in minimal water depths. 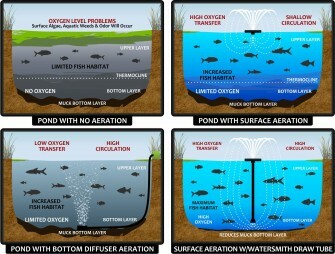 Bottom aeration is best in deeper water (ponds deeper than 6′). The rising bubbles through the water column push large amounts of dead, bottom water and carry it to the surface where the harmful gases (mostly methane and sulfur compounds) can vent into the atmosphere and oxygen can enter the water (refer to the 3rd quarter of the diagram above). The efficiency of this style of aeration is directly proportional to how much water the bubbles carry. Thus, deeper water allows for a better circulation using bottom aeration and each diffuser can move more water the deeper it is placed. The WaterSmith Draw Tube allows our WaterSmith fountains to circulate the bottom water while continuously aerating the the surface as well (refer to the last quarter of the diagram above). It combines the best of both methods into a single, attractive fountain that will combat silt build-up, nutrient accumulation, algae blooms and fish kills! VIEW OUR WATERSMITH PRODUCTS for fountains and aerators to help with your pond aeration. We provide a full line of Kasco fountains and aerators as well as our innovative WaterSmith fountains. Our staff will work with you to find the fountain or aerator that best suits your needs. If you have a question, please contact us for more information.